You may have never heard of a puppymill before. That's because they are illegal operations, and with good reason. 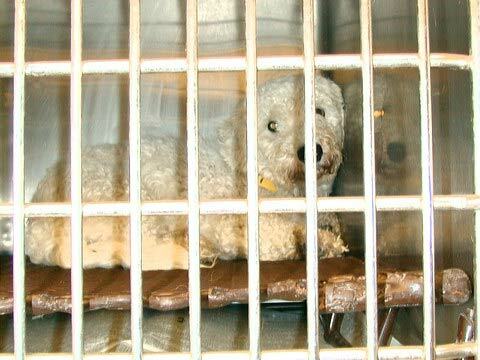 At least 80% of the time, a puppymill is a place where female dogs are kept in small crates in or outside. 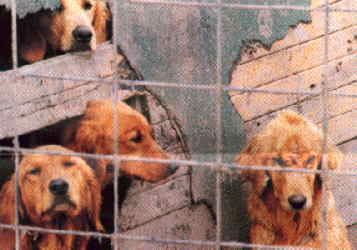 Inside, dogs never see the light of day, crammed into tiny crates, so small that the dog cannot turn around. The floor is chicken wire, so that feces and urine drop into the cage below. This excuse for a "floor" usually ends up making the inhabitants' feet and legs grow painfully deformed, their leg muscles eventually weaken until the dog can no longer even walk. 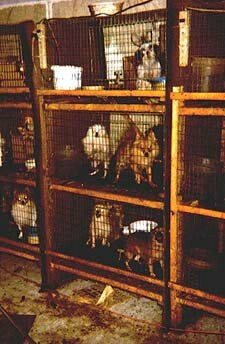 Cages are piled up to 20 on top of eachother, and line the walls of the building. Outdoor cages are for larger breeds of dogs, such as labrador retrievers. Outside, they are placed in bare cages, offered no shelter from wind, snow, or the beating sun. Food is scarce and moldy, water is either frozen or unfit to drink. Often, food bowls become infested with maggots and other bugs. Female dogs are force-bred every month (regularly, un-neautered/spayed dogs only go into heat once a year). Mothers are left in the above conditions. 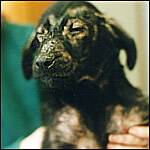 Puppies as young as two weeks are ripped away from their mothers, and sold to pet stores and breeders. Once a breeder can no longer reproduce, she is either discarded to an animal testing laboratory, or killed(shooting and gassing are the most common methods used, both of which are inhumane). Please do not support this industry. Rather than buying your dog from a breeder or pet store, go to a shelter, and save a life in need. You may want to buy a puppy from a pet store to "rescue" it and give it a loving home. But each time a puppy is bought from a pet store, the mill supplying that store increases production (Simply put: Supplier needs more puppies, breeds more dogs, and the vicious cycle begins again). Please, save a stray. Give a dog a second chance, adopt from a shelter.